The number of people with obesity could skyrocket to 850 million globally by 2025. We need to act now. With just over 4,000 days left to transform our world and achieve the goals set out in the 2030 Agenda for Sustainable Development, there is a very real possibility that we could fall short on achieving a crucial aim that impacts all the others – namely Sustainable Development Goal 3: “Ensure healthy lives and promote wellbeing for all at all ages”. This goal is critical to achieving all other economic, environmental and social objectives, since they are only possible with a thriving, healthy human population. There has been significant progress on many SDG 3 targets, but target 3.4 – “reduce by one third premature mortality from non-communicable diseases (NCDs) through prevention and treatment and promote mental health and wellbeing” – is severely lagging behind. According to the World Health Organization, deaths from NCDs rose by 12.5% from 36 million in 2010 to 40.5 million in 2016. Preventing the increase in preventable death and suffering requires decisive action on obesity. Obesity is a risk factor for NCDs as well as a disease in its own right. It is generally accepted that there is a significant association between obesity and cardiovascular disease, which is the leading cause of death worldwide. Similarly, type 2 diabetes and numerous other diseases are often related to obesity. Rates of obesity have almost tripled since 1975, and more than 650 million people worldwide live with obesity today. The World Obesity Federation projects that, if progress is left unchecked, the number of people with obesity could soar to 850 million by 2025, increasing the number of NCD-related deaths and putting SDG 3.4 beyond reach five years before the 2030 deadline. People with obesity, both children and adults, are the subject of bias and stigma that perpetuate poor health outcomes for those affected. 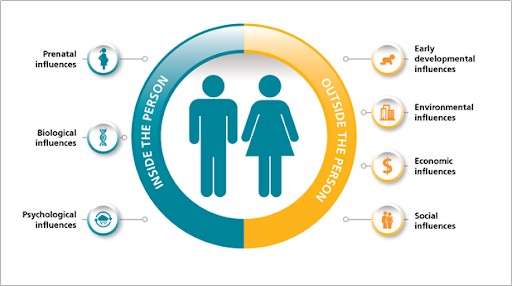 For example, in Australia, two out of three individuals with obesity report at least one direct or overt experience of stigma in their daily lives. Weight bias and stigma are rooted in misperceptions that obesity is the result of lack of willpower, laziness or gluttony and is the responsibility of the individual alone. A focus on personal habits prevents society acting to combat the rising prevalence of the disease. 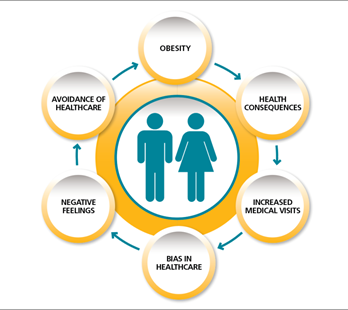 These misperceptions affect multiple aspects of daily life for people with obesity, and can prevent them seeking care and result in a lack of support from healthcare professionals. One in two physicians (50%) in the US regard patients with obesity as “awkward, unattractive, ugly and non-compliant”. Not treating obesity like any other disease translates into a vicious cycle of inaction and increases the risk of obesity-related complications. Several studies have shown that weight loss is associated with a reduced risk of complications and overall improved health in people with obesity. However, achieving weight loss and maintaining a lower weight can be difficult. Once we gain weight, our bodies actively work to ensure we keep it on. Weight loss triggers a hormonal response that ensures increased appetite and reduced energy expenditure. This response does not subside until several years after the initial weight loss. The growing challenge of childhood obesity reflects how bias and stigma are preventing society from addressing the determinants that lead to obesity. Today, more than 380 million children and adolescents under the age of 19 are already overweight or have obesity. Continuing to place the blame on the individual is neither fair nor accurate, and as a society we need to face up to the fact that, until we recognize obesity as a disease that requires both personal and societal action, we are going to see increasing numbers of people living with and dying from NCDs – moving us further and further away from achieving the SDGs. Obesity is a complex and progressive disease brought on by multiple factors, including physiological, psychological, genetic, environmental and socioeconomic issues. We are already paying the price for the obesity epidemic. It is estimated that the health consequences of the condition will cost more than $850 billion in 2018 alone. If we fail to act, this figure will rise to 1.2 trillion dollars by 2025, threatening to put the SDGs decisively beyond our reach. 1. Treat affected people with respect and dignity, and give them an equal right to patient-friendly care, to the same standards as those living with other serious chronic conditions. 2. Engage with broad coalitions of actors, including policymakers, people with obesity, healthcare professionals and the private sector. 3. Create environments where the easy choice is the healthy choice for food, exercise and transportation. There is no time to waste. Bold and concerted action to reduce the burden of obesity is needed now – before the problem becomes too difficult to handle.